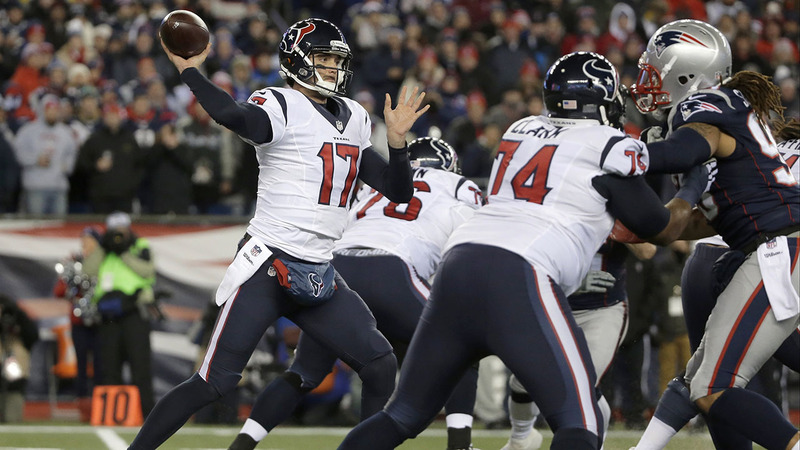 FOXBOROUGH, MA -- The Texans fell to the New England Patriots 34-16. Lewis became the fifth Patriots player to score three touchdowns in a playoff game. He's also the first player in the Super Bowl era to score on a rush, a catch and a kick return in a postseason game. The Patriots (15-2) survived a gritty effort by the Texans' top-ranked defense, which intercepted Brady twice. Houston's special teams also forced a third turnover. But the Texans (10-8) couldn't find enough traction on offense to take full advantage of the Patriots' mistakes, settling for field goals on both of Brady's picks. Houston's Brock Osweiler was intercepted three times after that, and the Texans managed only a field goal the rest of game. Brady finished 18 of 38 for 287 yards and two touchdowns and was showered with chants of "MVP! MVP!" and "Brady! Brady!" late in the game. Julian Edelman was Brady's most dependable target, catching eight passes for 137 yards. A.J. Bouye intercepted a slightly overthrown ball by Brady late in the first quarter on a pass that bounced out of the hands of receiver Michael Floyd. That led to a 27-yard field goal that cut New England's lead to 14-6. Jadeveon Clowney was in Brady's face all game, flattening him in the first half with a legal hit and bringing him down a couple of times in the second on plays that were a little more questionable. Patriots kicker Stephen Gostkowski continues to climb the NFL's career postseason scoring list. He made an extra point in the first quarter to pass Rice and move into third place on the league's career list. It was Gostkowski's 133rd postseason point, breaking a tie with the San Francisco 49ers receiver. Next up are kickers Gary Anderson, David Akers and all-time leader Adam Vinatieri, who had half of his 234 career postseason points with New England before moving on to the Indianapolis Colts. Patriots: Will host either Pittsburgh or Kansas City in next week's AFC title game.